The Senate Judiciary Committee hearing dedicated to giving both Supreme Court nominee Brett Kavanaugh and the woman who accused him of sexual assault, Christine Blasey Ford, the opportunity to testify on their versions of the events in question is slated for Monday. Ford recently gained national attention after disclosing she was the anonymous author behind the letter, released by Sen. Dianne Feinstein Friday, that alleged Kavanaugh committed sexual assault in the 80s. In the note, the Palo Alto University professor tells the harrowing story of a drunk teenage Kavanaugh locking her in a room with himself and his friend, pinning her to a bed, groping her over her clothes and covering her mouth when she attempted to scream for help. Since then, she has provided therapist notes and results from a polygraph test administered by a former FBI agent to the Washington Post to corroborate her account. 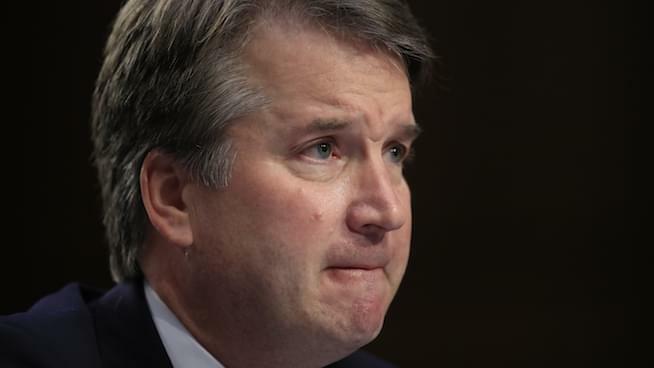 Kavanaugh continues to “categorically and unequivocally” deny the incident occurred. With so many unprecedented factors at play, Attorney David Katz says it’s hard to say for certain what will transpire from the hearing, which Ford has reportedly failed to confirm her attendance of. Host Chip Franklin invited Katz to speak on the show in order to get a clearer understanding of potential outcomes. According to him, Kavanaugh could be withdrawn from the running for Supreme Court justice as early as next week if things don’t shift in his favor.